There are currently 91,440 users on this website. I'm getting the "Winter blues" so I wanted to have some fun. Post your "missed it by one number" note. I'll start the ball rolling. If only the 2nd 1 & 2 were reversed!! ... or if the first 0 and 3 were reversed it would be a repeater. Oh yeah - never even saw it. I've had more than a few of these but have set them all free. Best I've ever had was 4 numbers off. Still lookin! If my metal detector detects a metal medal, does it not, at that point, become not only a metal detector, but a medal detector and a metal medal detector as well? Given the number of "almost" notes we've seen here in this forum, this thread should be bursting at the seams in short order. That KC note had to hurt Steve. It's a Lucky Money note from the BEP.....Imagine being the collector that ordered seven notes after me. The note was scanned while still in the BEP sleeve. You can tell by the rounded lower corners, and if you've ever held a BEP holder, it feels softer and more flexible than normal currency sleeves and smells like a plastic beach ball. 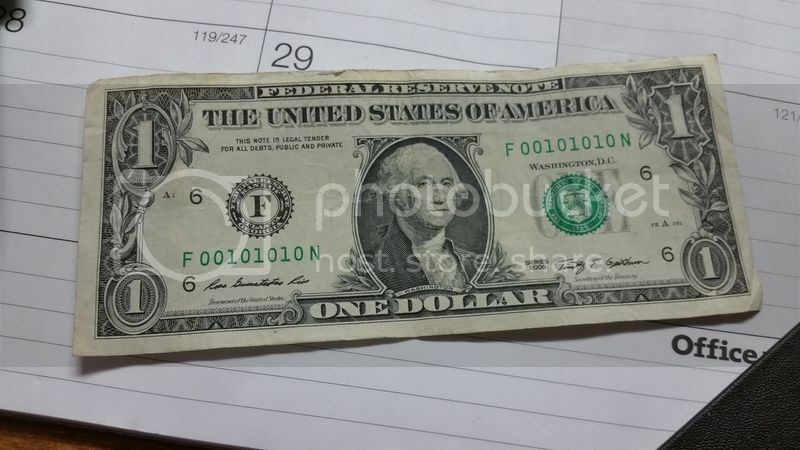 Lucky money note = Binary Note. Really cool note. Yea I bet the look on the guy that got the solid 8's was priceless. So I am curious- is a note like that something you would send off for a grade, or not worth it? While this one is a binary, it could have been so much better. At least I picked it up for face. I had a 1995 $2 with serial B10071008A. I spent it. It took 1.21 seconds to rattle this change.